A band of men are on a journey. One man named Leo accompanies the men, doing their menial chores, and sustaining them with his spirit and song. All goes well with the journey until Leo disappears. The group falls into disarray and the journey is abandoned. It seems that they cannot make it without their servant Leo. After many years of wandering, one of the men in the group that took the journey finds Leo. He finds out that Leo is actually the titular head of the organization that sponsored the journey. He was the leader even as he attended to the needs of the men on the journey many years ago. The great leader was seen and experienced as servant first. — Adapted from a citation found in Robert Greenleaf’s Servant Leadership, summarizing the story of Herman Hesse’s Journey to the East. Servant leadership. Servant-leader. Leader as servant first. Servant leadership emphasizes the leader’s role as steward of the resources (human, financial and otherwise) provided by the organization. It encourages leaders to serve others while staying focused on achieving results in line with the organization’s values. Servant leadership differs from other leadership approaches by eschewing the common top-down hierarchical style, instead emphasizing collaboration, trust, empathy, and the ethical use of power. Leo was a servant leader. Is this possible for real? 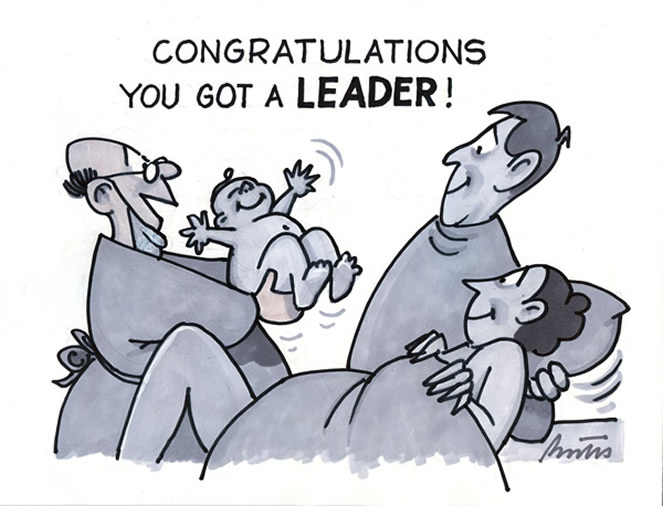 I remember once getting into a heated argument about whether leaders are born or made. My colleague was making a cogent argument that leaders are born. Leadership development was essentially a scam, he said, an operating-on-the-edges activity that produced marginal leadership behaviors that did not translate into results. Of course I countered with an argument that leadership has been extensively researched, and that there is in fact a leadership science that can be studied, learned, applied, and executed, to good effect. I’m not entirely sure, but I think I was wrong. I have serious doubts now that managers can actually learn to be great leaders. I still believe that leadership development can teach the essentials of leadership. I do believe that emerging leaders can learn principles and practices that can help them lead their people and their organizations. But I think learning and development produces men and women who know about leadership, and may begin to lead; and even lead effectively. But servant leadership is a different animal entirely. Caring is required. A willingness and commitment to serve. Can caring, and a willingness and commitment to serve, be learned and/or developed? More likely born, not made. But possible and real, I do believe. Thanks John, as always for your insightful & thoughtful post. Those reading this might want to also read Phillipians 2:1-7 & John 13:1-16 from the Bible which speaks on this topic as well. Powerful observation. If anyone is to become a servant leader as an adult, real transformation is required. I believe that kind of transformation is possible, but not through books and seminars. 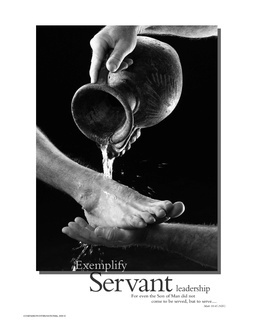 The stories of Jesus Christ from the New Testament exemplify servant leadership. You don’t have to be a Christian to read these stories and see the power of that kind of leadership. Your first photo above is certainly a reference to Jesus washing the disciples’ feet in the book of John, chapter 13. And the encouraging part is that the band of 11 rather bumbling and fumbling apostles who followed Jesus for 3 years were transformed–as adults–into amazingly effective servant leaders. It’s interesting to note that it wasn’t through spending 3 years in the presence of Jesus that transformed the apostles. In fact, near the end of his ministry with the 12 disciples, the book of John chapter 16 records Jesus saying to them, “Do you finally believe?” Only a few hours later, all 12 abandoned him when he is arrested. To me, this illustrates that no amount of study or even close association with a true servant leader can turn a person into one if she isn’t already. That kind of change is more foundational. Only a spiritual transformation–which the disciples experienced in the 2nd chapter of Acts–produces that kind of change. I’ve witnessed adults both young and old be entirely transformed in their personality, priorities, demeanor, and sense of self in relation to others through a spiritual awakening–specifically a Christian one. In John 3:3, Jesus speaks of this kind of change, and calls it being “born again”. So, your statement above is true…servant leaders are born. One cannot make himself into a servant leader through effort and intellect. But one CAN be born again! My point? Those who seek leadership should seek rebirth. After all, eleven uneducated Galileans started the worldwide Christian church this way. Note: Christianity has had plenty of outspoken, self-promoting representatives who have lived authoritarian lives and oppressed those they should have been serving. But poor followers of a great message (the life and teachings of Jesus) should not discount the message. What’s more, one of the first oppressors of those who followed Jesus–a man named Saul of Tarsus who personally oversaw the stoning of Stephen in Acts 7:54-8:1–was transformed into the apostle Paul who became the messenger of the gospel to the non-Jewish world, and a servant leader until his death in Rome. Personal transformation doesn’t get any more dramatic than that!